ARE WE IN YOUR CALENDAR? 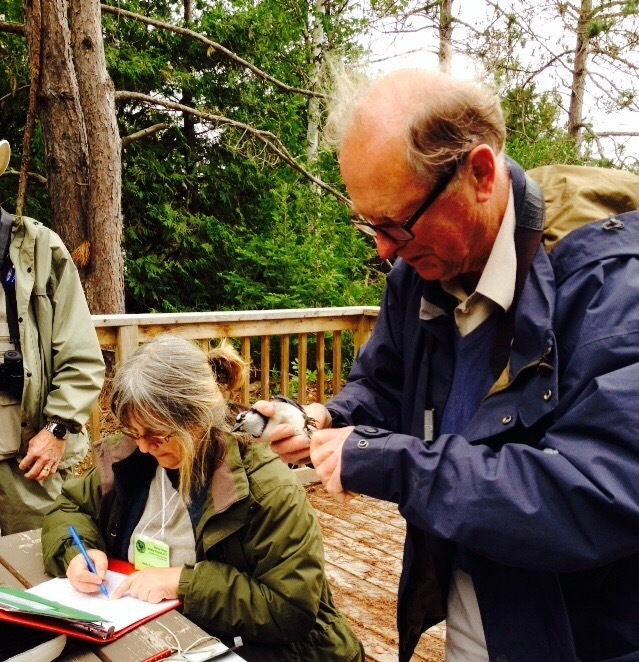 The 18th Huron Fringe Birding Festival is now in the records. And, what a record it is. Thanks to all our loyal and enthusiastic attendees, the Festival (without considering the Family Weekend) grew in attendance by 10%; with the addition of the Family Weekend the growth was 40%. 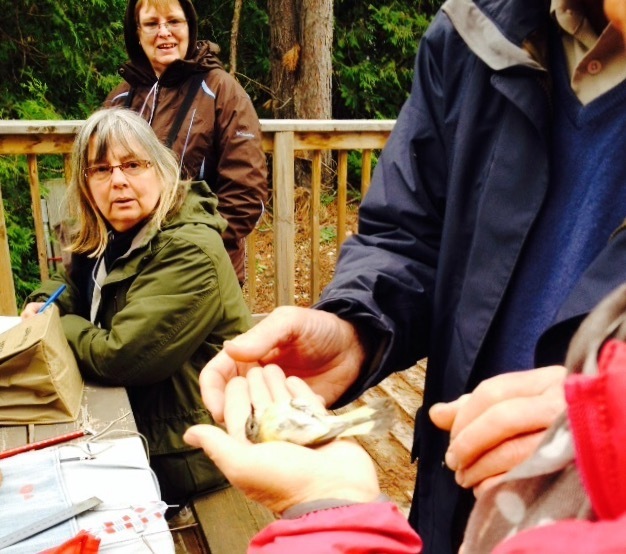 All in all we welcomed 450 registrants to our home base in MacGregor Point Provincial Park situated at the base of Ontario’s Bruce Peninsula, which is a natural migration corridor. The 275 regular program registrants were well above the 259 in 2014. 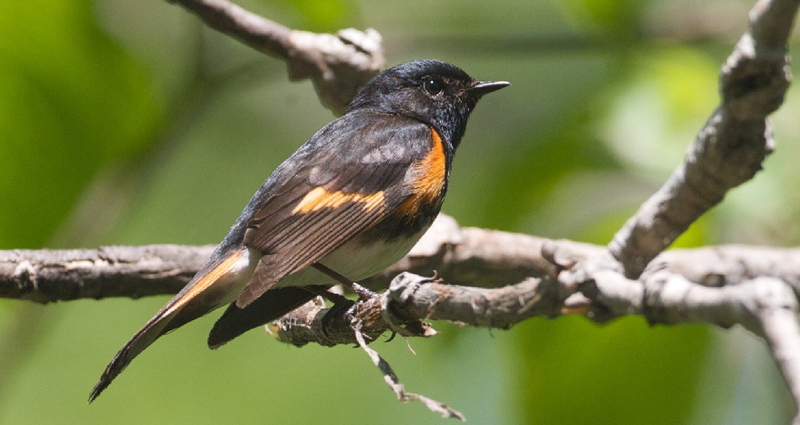 An all-time high of 197 bird species were sighted. The Festival held its first, highly successful, Family Weekend with 89 registrants…and will continue in 2016. We were selected as one of the Top 100 Festivals in Ontario for the second year in a row. Nor can we forget our partners, corporate and community sponsors and our silent auction donors. Their support has helped HFBF immensely. 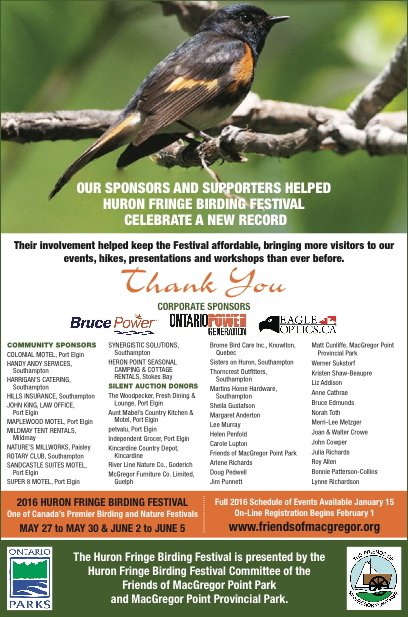 Your Program Committee is well on its way with plans to make the 2016 Huron Fringe Birding Festival even better, so take note of the information below. This Blog will return with news of the upcoming HFBF program of events sometime in September. Stay linked in. Have a good summer. Follow us on Facebook: http://www.facebook.com/HuronFringeBirdingFestival. 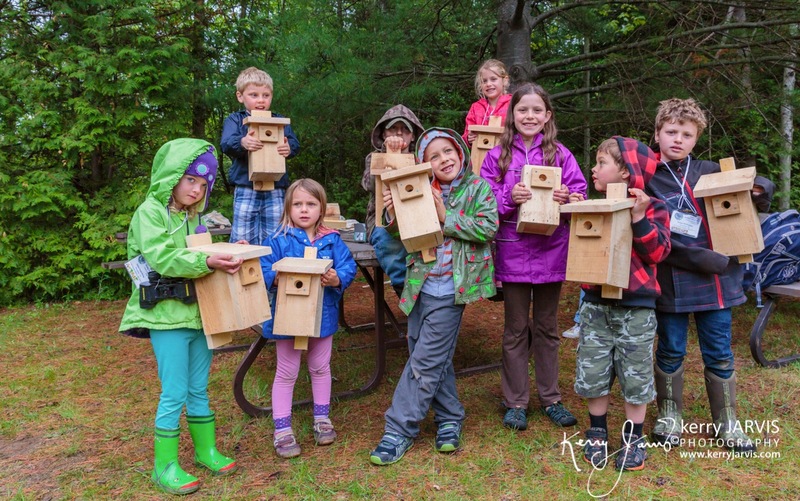 SARAH RUPERT, (one of this year’s leaders), has spent many years exploring the wonder of birds and nature and she loves to share her knowledge with others through interpretive programs, writing and mixed media art. 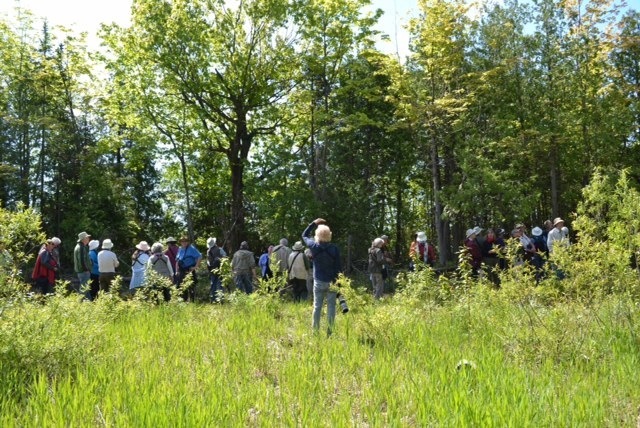 Here, she talks about her recent HFBF Event – Nature Sketching and Journaling – and sends along some photographs of her participants and what they saw. 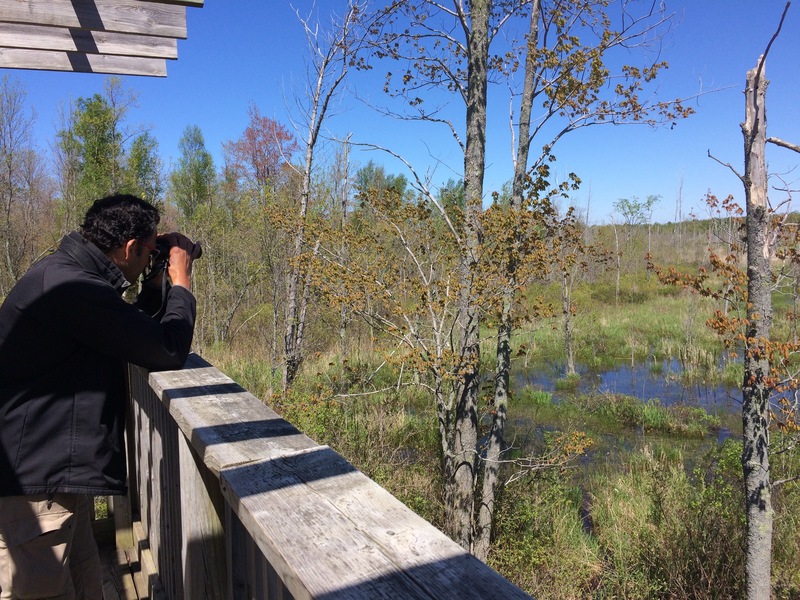 One the best things we can do to learn more about nature is to really take the time to observe what we are seeing in the field. This is where a natural journal becomes and invaluable tool. By taking the time to make careful observations and record these observations, we begin to really understand what we are seeing, rather than just checking a name off a list. Sketching what we see can take our observations to an entirely new level! Everyone can learn to sketch in the field – the quality of the final product is not important…it’s the process of observing and recording that really matters. 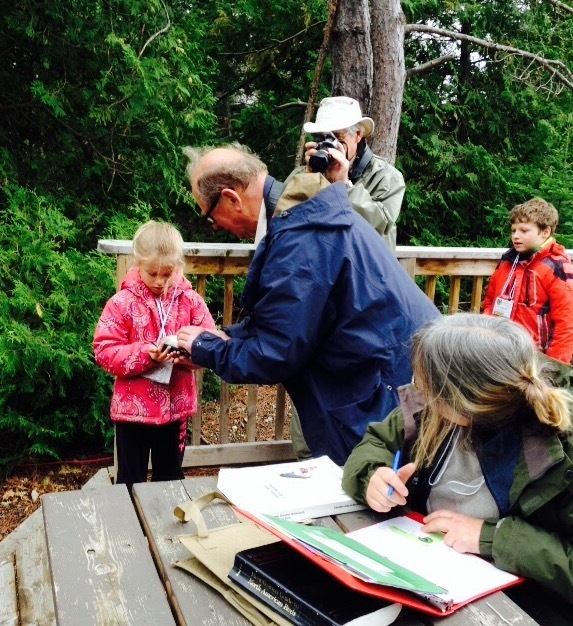 Nature journaling documents your adventures and helps you hone your observation skills. You’ll be surprised what you’ll be able to capture by the end of the session. 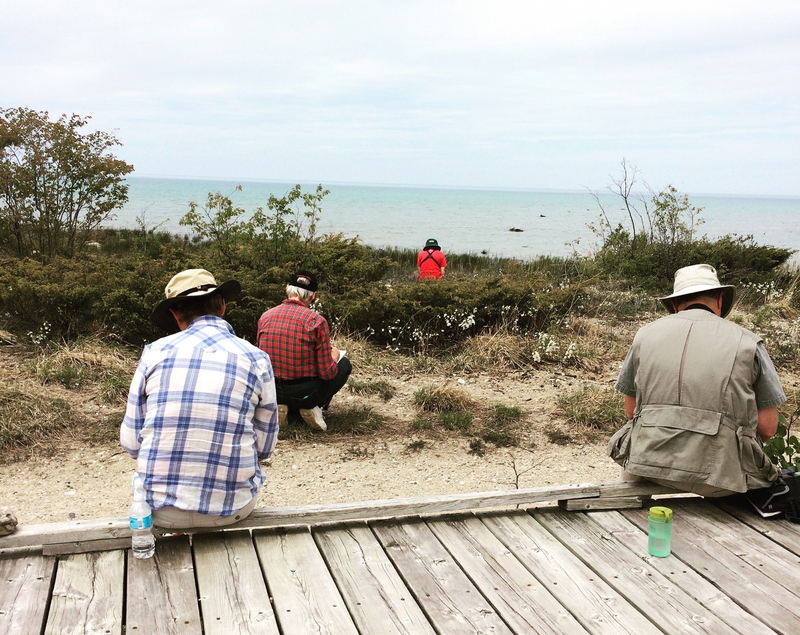 Participants in the Nature Journaling workshop quickly became part of the environment, enjoying the sounds of a Song Sparrow and the gentle waves along the shoreline, while getting to know their subject matter. 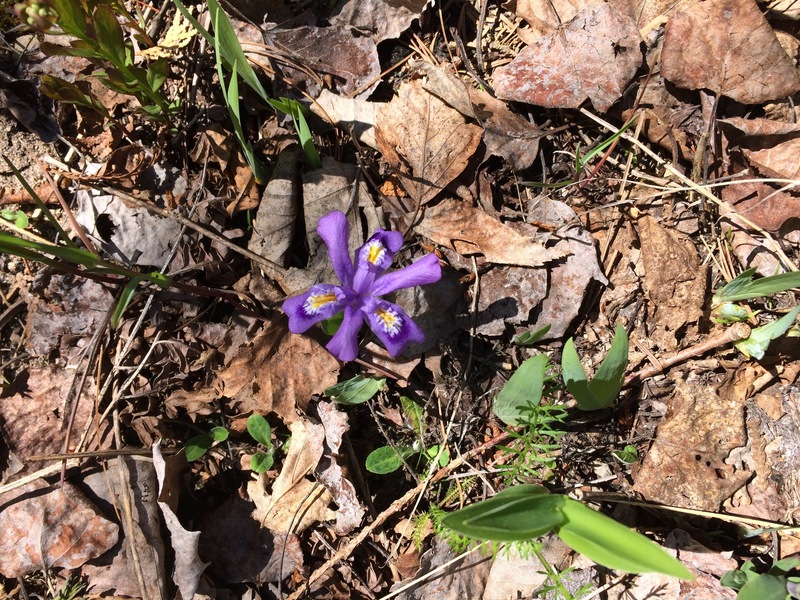 Dwarf Lake Iris in full bloom, much to the delight of the participants of the first weekend’s hikes. The view of from the Tower overlooking the DU Pond on Tower Trail is always a highlight for participants. A panoramic view of the Lake Huron shoreline from MacGregor Point Provincial Park. 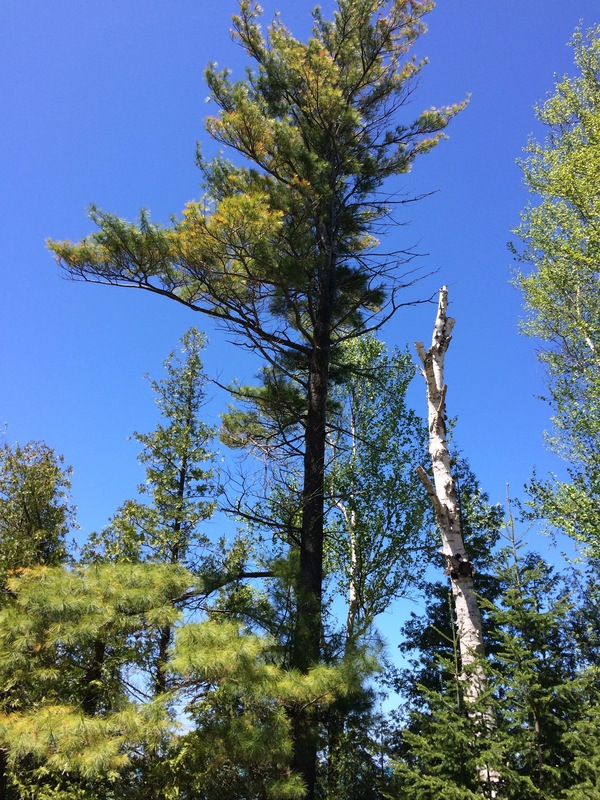 To Sarah Rupert, this windswept pine along the MacGregor Point shoreline is a classic symbol of the Lake Huron Shoreline…and more good memories. 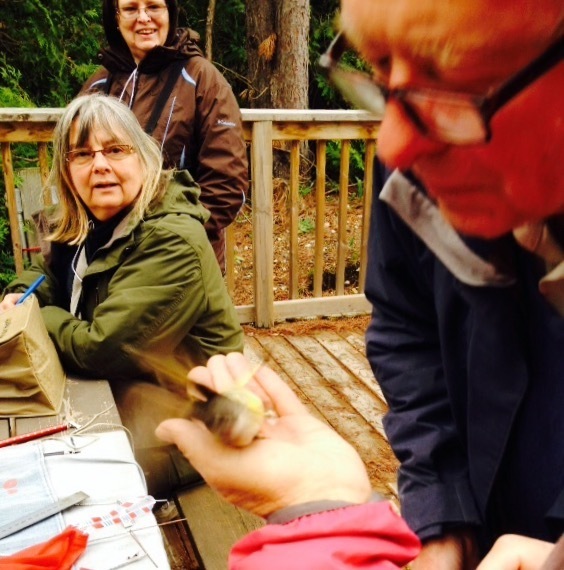 Bird Banding was one of the highlights of our Family Weekend. 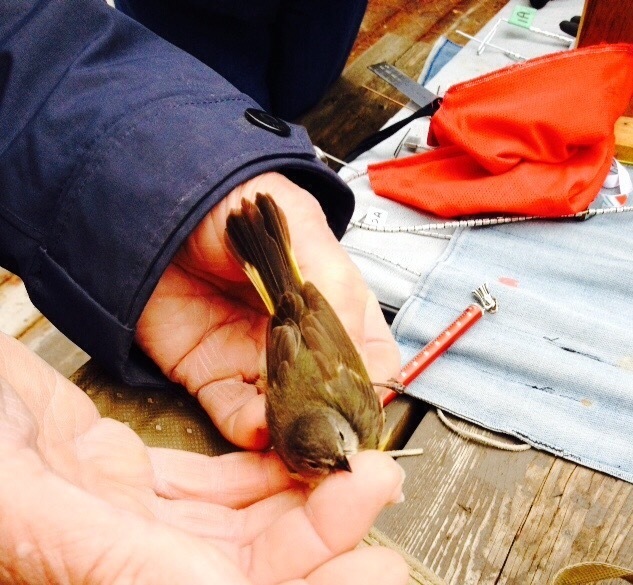 It was the one place where children could actually see, touch and learn more about birds. And David Brewer was as attentive with the kids as he was with the birds. Probably because David started birding at their age; when he got his first bicycle, at about age eleven. He got his master bird-banding permit at seventeen. By profession he is an organic chemist, with degrees from Cambridge and Glasgow. Much of his spare time in Scotland was spent banding Gannets and has the scars to prove it. After graduation he did a years’ fellowship at the University of Arizona, from where he made many forays into Mexico, thereby starting one of his major interests, Neotropical birds. 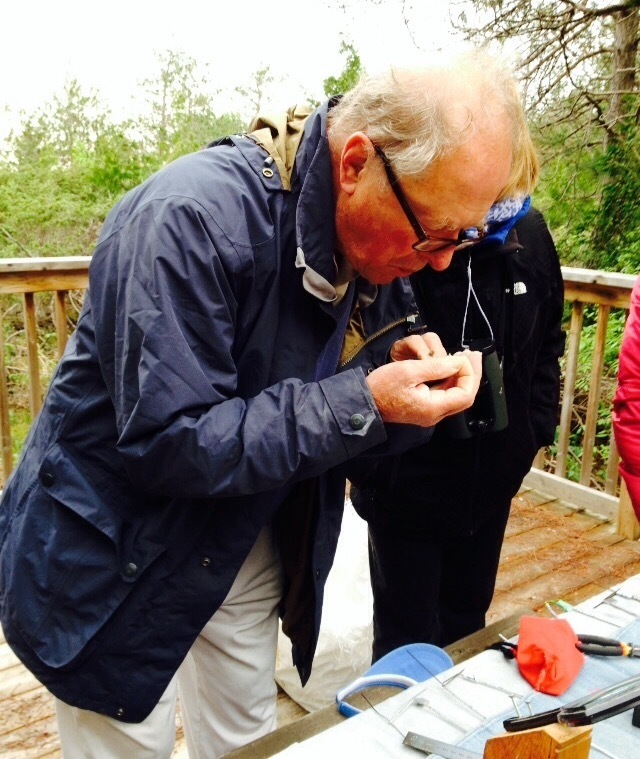 Since retirement from Uniroyal Chemical in Guelph he has spent his time travelling (to all seven continents), guiding on Polar cruises (he’s been to Antarctica twenty-five times and the North Pole three) and writing bird books, including a birders’ guide to Central America. 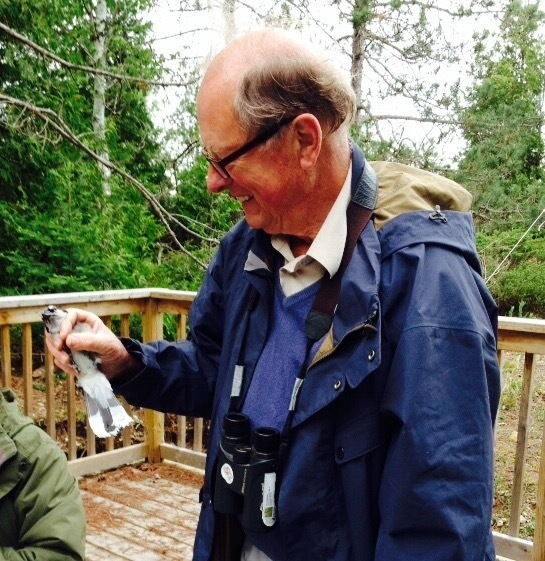 His main interests are bird conservation, banding and migration. He was asked if the bird was a “boy or girl”. He demonstrates a sure fire way to find the quick answer. Blow on its belly and see what you find. Give them a moment and they’ll be gone. No harm done. Take off time. See you all next year. You’ll recognize me by my band. All photographs courtesy of Norma Nanni and her IPad.